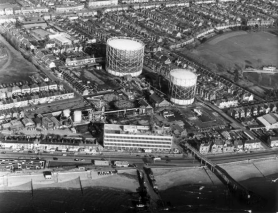 The site was formerly occupied by the Southend Gas Works. The site is located on the Eastern Esplanade, Southend-onSea and is bounded by the Thames Estuary 50m to the south and residential properties to the north, east and west of the site. The site occupied an area of 2.5 hectares and has planning permission for over 200 residential properties. The site was historically utilised for coal / coke storage and gas purification. In recent years the site has been utilised as a gas distribution depot, a contractor’s yard and a boat maintenance / storage yard. The historical usage of the site as a gas works had resulted in significant soil and groundwater contamination. The identified contaminants on-site reflected the historical usage of the site and included heavy metal pollutants (arsenic, trivalent and hexavalent chromium, copper, lead and nickel), total petroleum hydrocarbons, polycyclic aromatic hydrocarbons, phenols and ‘total’ cyanides (free and complex) associated with spent oxide (‘Blue Billy’) wastes identified on-site. The remediation strategy for the site was designed to address the identified source contamination with the intention of protecting both human health and groundwater / surface water receptors (in particular the River Thames). The ex-situ remediation works involved the treatment of circa 14,300m³ of contaminated soils and 1,500m³ of spent oxide waste (containing high levels of total cyanides). The treatment process involved mixing the contaminated materials with the designated E-Clay in slurry form and cementitious materials in dry form. A specialist mix formulation was utilised to treat the spent oxide wastes to ensure that free cyanides were not generated by the treatment process – the objective was to drive the reaction equilibrium to form complex cyanides which have low toxicity and solubility – these complex cyanides were then stabilised by the treatment process. The contaminated soils / spent oxide wastes (and associated groundwater) were treated in 5m³ batches utilising specialist processing buckets.